Prototype: Airport building with many possibilities for play on several levels and different variations for connection to the track, as a kit for children. Model: The Airport Building offers many different possibilities for play and has a battery-operated light and sound function. Different variations for connection to the track are possible. One of them is the possibility of using the track for the Märklin my world elevated railroad in combination with the Airport Building. The Airport Building can be combined at the same time with different and various track patterns by using variations for making connections to the track on Level 0 and Level 1. The road connections are compatible with the Majorette Creatix road system. 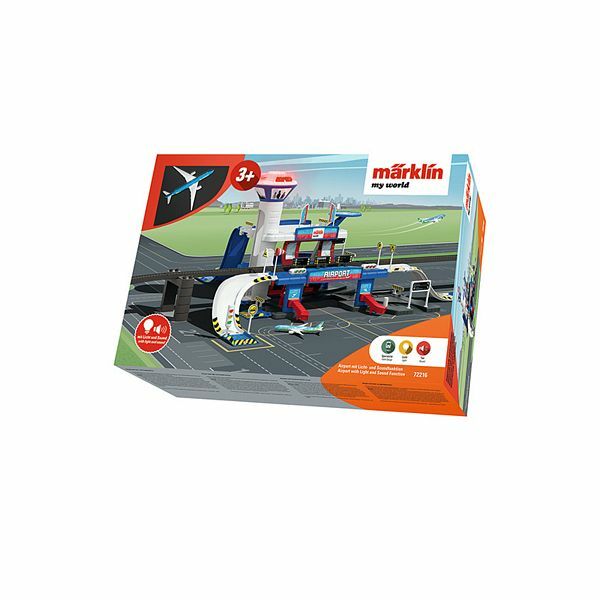 As a sturdy snap-together kit, the Airport Building is suitable for children ages 3 and up. A sheet of stickers and instructions for assembly are included. Batteries are included. The Airport Building comes in individual pieces as a kit.